Imagine coming face to face with a massive Tyrannosaurus Rex or a Stegosaurus. Now picture what it'd be like to actually be a dinosaur! Ok that's not really possible...or is it? 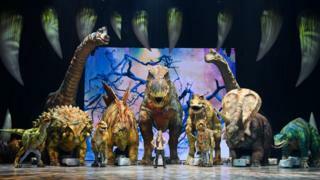 A herd of 18 dinosaur puppets are used in the 'Walking With Dinosaurs - The Arena Spectacular' live show. They're all life-size and have been designed to look and move like the real thing. A team of puppeteers bring them to life on stage. Newsround's been to meet them while they tour the UK, to find out what it takes to be a dinosaur. Jurassic World: Stars take on the Dino Quiz! 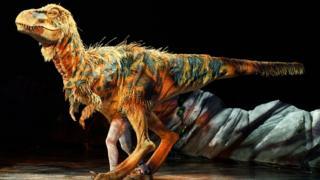 What's the deal with this 'very weird' looking dinosaur? Is this the biggest dinosaur ever? How do you (re)build a dinosaur? My ancestors discovered a dinosaur called the Iguanodon. I think I would be that one! I got a diplidocus!! My favourite!! !